Shopify is one of the world’s most popular eCommerce platforms, allowing you to quickly set up an online store. It’s great for making beautiful eCommerce sites relatively quickly and easily. Out-of-the-box, Shopify page speed is good but it can be vastly improved. PLEASE! Before you read this guide, check out our compendium ‘How to do anything with Shopify‘. We promise you, this guide will help you rank better, convert better and sell more. 4.7 7. Did we say optimise your images? The main area to focus on when optimising, is Shopify page speed – the time it takes for your page’s content to load. This is important because visitors now expect web pages to load really fast. After more than 3 seconds, 40% of visitors will leave a page. Google has also recognised this, and as such has made pagespeed part of their ranking process, which means that pagespeed also plays a part in your overall search ranking in Google’s new mobile-first indexing. Page speed is important to any website, but it becomes especially important when it comes to eCommerce. Slow page speeds throughout the buying process can make a big difference. Moreover, when it comes to AdWords, your page quality score is a factor. The lower the score the more you’ll have to bid on each keyword. This means any adverts you want to put on the search engine may require more money to get them displayed. One statistic referenced by Shopify indicated that if an eCommerce site makes ‘£100,000 per day, you could lose up to £2.5 million in sales every year for just a 1-second delay’. This is an area where a lot of Shopify stores fall short, but there are ways to fix that – read on to see how you can optimise the page speed for your Shopify store! This is important and an easy way to boost page speed on any website, but especially when it comes to Shopify. It’s hard to sell products without displaying plenty of images, and as a result image files often end up taking up a large amount of a web page’s content. 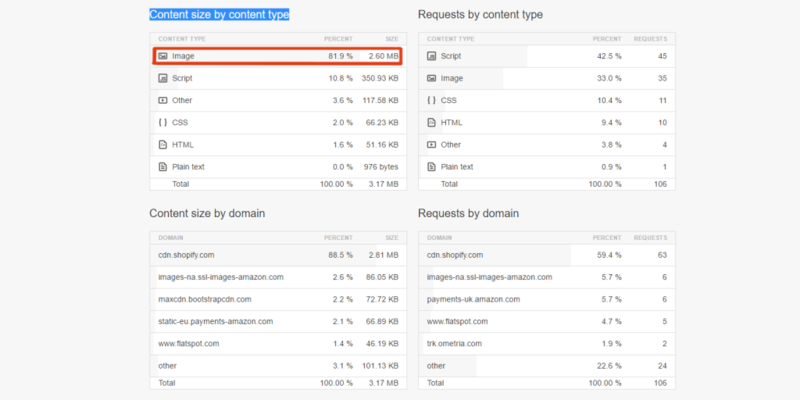 Just look at the analysis from Pingdom of one Shopify store below, where over 80% of the content is made up of images! If you can get your image file sizes down, this will go a long way in bringing down the page load times. Because of this, we have a whole article dedicated to the ways you can optimise images for Shopify. Your web pages will thank you for taking the time to understand the process! And once you understand the process, carrying it out is simple. We conducted a Shopify speed test in Pingdom and were quickly able to cut the image file sizes down without major compromises to the quality. The images below demonstrate this, with the original being over 3 times the size of the optimised version we created. The unoptimised above image is 349.7kb, whilst the optimised version is 105kb – but the difference in visible quality is not as discernible. Getting rid of unnecessary carousels: whilst they can be pretty, these tend to display lots of high resolution images. If you can get away with using just one stunning image (preferably one that is optimised), so much the better! If you haven’t chosen your theme yet, then make sure to take the time beforehand to pick a streamlined one. You can get an idea of how optimised for page speed they are by putting the theme’s preview URL into Google’s Pagespeed Insights tool, and seeing what sort of assessment it gives. If your store has been up and running for a while, you may have a bloated list of apps. Forgotten apps you’d tried and tested long ago that are no longer being used. But even if you aren’t using them, if they are installed they can create HTTP requests that slow the loading of a page. Apps are one of the biggest contributors to decreasing your Shopify page speed. Audit your apps and plugins, now! Breakpoints are points on your mobile website where the page will resize (if necessary) to suit the dimensions of the screen the visitor is viewing the page on. Having these points on your mobile page not only improves the visitor’s experience of the website, but also the loading time. Thus, it’s worth checking your Shopify theme to see whether you can implement them, and if so, which breakpoints you should use and where. Lazy image loading is where only images that are visible in a visitor’s viewport are loaded. This is handy for Shopify as many pages have lots of images on them, but a visitor won’t necessarily be seeing them all at once. If you don’t have time for any of the above, consider a one-off app. There are apps that have been developed specifically to help shopify store owners speed up their website. This is not as cheap and gives you less control, but is unarguably quicker and easier than doing it yourself. One of the most popular ones is Pagespeed Guru, which has a one-time fee of $29. It does a decent job but if you want to properly optimise your Shopify page speed, you’ll never beat a manual process. 7. Did we say optimise your images? Please optimise your images. They’re vital to improved page load speeds. Check out our simple guide to optimising Shopify images. It’ll take 20 minutes and the gains will last …a lifetime! Here at The Content Works, we’re experts in making websites faster. Our long list of happy eCommerce clients on platforms from Shopify to Magento, WooCommerce to Volusion. We can improve your Shopify page speed even if you don’t have the fastest Shopify theme whether it is a custom theme or an off-the-shelf product. Need a faster website? Give us a call on 0207 305 5599 to discuss how we can help.